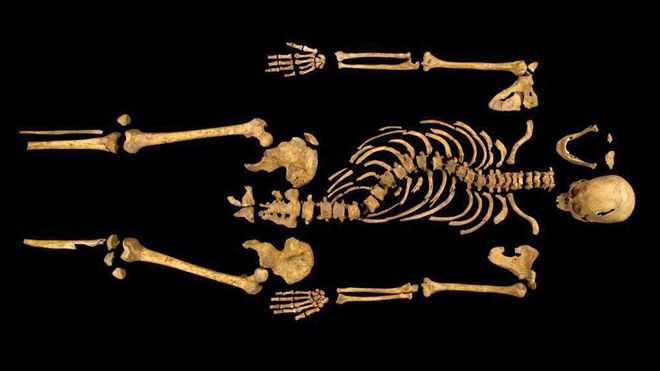 Home » archaeology , biology , england , history , richard iii » Missing no more: King Richard III found at last! Missing no more: King Richard III found at last! They paved Plantagenet and put up a parking lot. The realms of history and archaeology are run amok with chatter this day with the news that the remains of King Richard III, the last of the Plantagenet monarchs, have been positively identified. The bones were discovered last year beneath, of all places, a parking lot in Leicester. 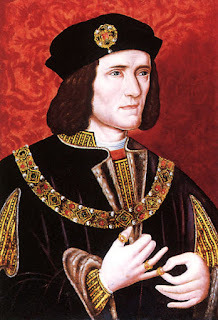 Richard III ruled England from 1483 to 1485... and what wild years they were! It was the War of the Roses between the houses of York and Lancaster. And then that upstart Henry Tudor crashed the party. Richard III and his army fought the Tudor boys at the Battle of Bosworth Field on August 22, 1485. It did not go well: Henry Tudor won the day (before going on to become King Henry VII) and Richard III was killed in manner most foul! Regardless of the nasty propaganda that the Tudors disseminated about him (and which Shakespeare unwittingly helped to perpetuate) it can't be denied: Richard III had a severe case of scoliosis. Anyhoo, it's really him! The wounds found on the skull correspond with reports of those Richard received at Bosworth Field. And analysis of mitochondrial DNA from the bones and those of Michael Ibsen - a descendant of Richard's sister, Anne of York - have confirmed it. And where has Richard III been for many of the past 528 years? Buried beneath a modern parking lot in Leicester. It's been announced that Richard III will be re-buried - this time with a coffin and proper honors - at Leicester Cathedral. But I'm certainly not alone in the desire that some day Richard III will be given the resting place due him in Westminster Abbey. Wheverever it is he winds up now, it's awesome news that Richard III has been found at last. The king is dead. Long live the king! "Does this renew hope that Jimmy Hoffa will yet be found, or what?" Well it took about 527 years to find Richard III...so Jimmy Hoffa's bones should be found some time around 2502 ;-). I would bet solid money that in the near future we are going to be getting the announcement that Temujin's grave has been located. Temujin... or as he's better known to western history: Genghis Khan. Archaeologists have been searching for his tomb for decades. And apparently they might be getting *really* close.